The biomechanical study found that the Acumed Acutrak fully threaded headless compression screw with continuously variable thread pitch is potentially favorable over partially threaded cancellous screws for the compression of medial malleolus fractures. The increased resistance to both axial and shear loading, greater interfragmentary compression, and low-profile design of the Acutrak 2 headless compression screw may decrease the rate of clinical failure and reduce the need for revision surgeries. A recent study published in the Journal of Clinical Biomechanics examined a comparison of Acutrak 2®–4.7 mm fully threaded headless compression screws and 4.0 mm partially threaded cancellous screws and found Acutrak was the potentially favorable option for the fixation of medial malleolus fractures. The investigator-initiated biomechanical study was led by Robin Z. Cheng of the University of California Davis Medical Center. Additional contributors were from UC Davis and the Stanford University School of Medicine. The work was funded in part by Acumed. The study utilized 18 synthetic tibiae, each cut 18 cm from the tibial plafond, to simulate medial malleolar fractures. Each tibia was then randomly assigned fixation with either two Synthes parallel, partially threaded, unicortical 4.0 mm cancellous screws or two parallel, fully threaded Acutrak 2–4.7 mm headless compression screws, with nine tibiae in each group. To simulate tensile force on the fracture fragment, a single steel slotted spring pin was inserted through the fragment and attached to a steel cable hooked to a test machine actuator. Force was applied with an initial 50N then pulled at a rate of 10 mm per minute. 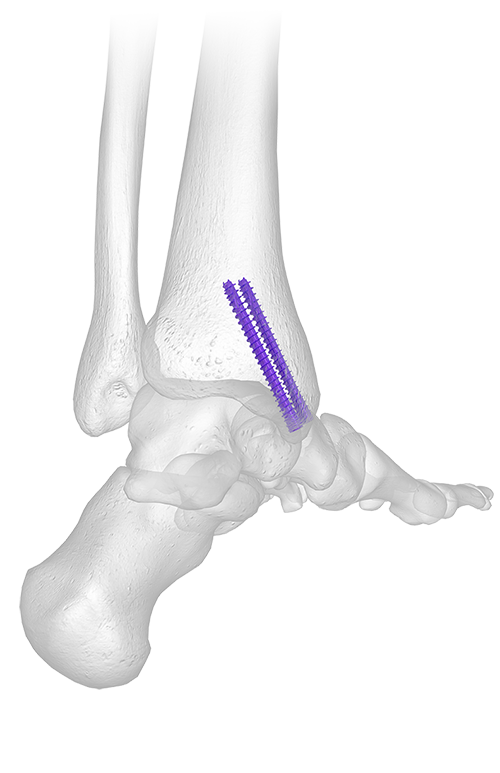 Distal and lateral movement was measured to failure via spherical markers placed on the anterior portion of the medial malleolus and monitored with a CCD camera. Clinical failure was defined as 2 mm of intrarticular fragment displacement, with construct stiffness measured in both distal and lateral directions. It is important to note that synthetic tibiae were used in this study rather than cadaveric bone. The Acutrak 2 screws, however, were noted by the authors as having a larger diameter than the 4.0 mm screws, which would engage more bone and potentially result in lower bone and screw stress. Additionally, artificially simulated axial loading in a single loading mode was observed in this study as a means to demonstrate the force exerted by the deltoid ligament on the medial malleolus without taking other soft tissue structures into account. And the tensile stress was modeled as a singular force, rather than cyclical loading, which would model stress over time. Acumed is a global leader of innovative orthopaedic and medical solutions developed to improve patient care. With 30 years of experience in the orthopaedic industry, our mission is to aid the afflicted through the ingenuity of our minds, the labor of our hands and the compassion of our hearts. Acumed was founded in 1988 by Randy and Mary Huebner and became a member of the Colson Associates group of companies in 1999. The company is headquartered in Hillsboro, Oregon with a global sales and distribution network supported worldwide. 1. Cheng RZ, Wegner AM, Behn AW, Amanatullah DF. Headless compression screw for horizontal medial malleolus fractures. Clin Biomech. 2018;55:1–6.